The Chelsea Mirror is made from the finest possible materials. The Chelsea Mirror matches our popular Chelsea Soft White Vanities. It can also be used in all areas of the home. The Ashburn Wall Mirror in White features a durable wood frame and decorative rectangular design to enhance both classic and modern decor. The understated finish brings classic sophistication to your bathroom area, coupled with clean lines and subtle designer detailing. The elegant mirror hangs vertically and comes with sleek brass mounting hardware for easy installation. The oversized Ashburn Wall Mirror in White from Home Decorators Collection features a durable wood frame and decorative rectangular design to enhance both classic and modern decor. A classic White painted finish brings a fresh and bright look to your bathroom, coupled with clean lines and subtle designer detailing. The elegant mirror hangs horizontally and comes with sleek brass mounting hardware for easy installation. The elegant Naples 36-inch x 32-inch poplar-framed mirror has an expansive, rectangular design and sleek white finish that complements a variety of bathrooms. Subtle architectural detailing highlights the beauty. Finished in sleek white, this versatile mirror will complement a variety of bathroom styles. The rectangular mirror is designed to be hung vertically. Mounting hardware is conveniently attached. Chelsea 34-inch L x 32-inch W Wall Mounted Decor Vanity Mirror in Soft White The Chelsea Mirror is made from the finest possible materials. The Chelsea Mirror matches our popular Chelsea Soft White Vanities. It can also be used in all areas of the home. 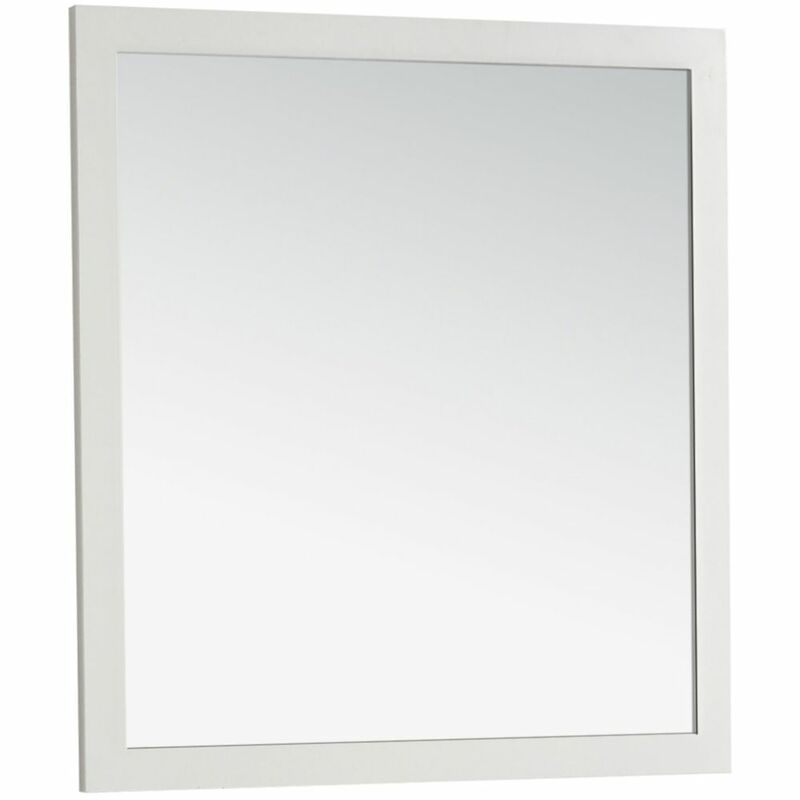 Chelsea 34-inch L x 32-inch W Wall Mounted Decor Vanity Mirror in Soft White is rated 3.8 out of 5 by 19. Rated 5 out of 5 by Joe from Mirror looks good, was the size I needed and price was great compared to other products I looked ... Mirror looks good, was the size I needed and price was great compared to other products I looked at. Very happy with this purchase. Rated 1 out of 5 by LK from Ordered this twice. Arrived broken twice.... Ordered this twice. Arrived broken twice. Rated 5 out of 5 by John from As advertised looks nice .... As advertised looks nice .